Years ago, when I ran ultras, I used to love to drive to San Francisco and run across the Golden Gate Bridge. I loved seeing the international crowds on the bridge, then jogging in contented silence up the trail that climbs the Headlands, with beautiful views of the Bay and Pacific Ocean. One morning, after an enjoyable 2-hour run, I returned to my truck by the Bay and paused for water and fuel. Should I continue? I had a favorite route that led past Fisherman’s Wharf and the ferry terminal, through downtown, and back over Nob Hill to the Bay. 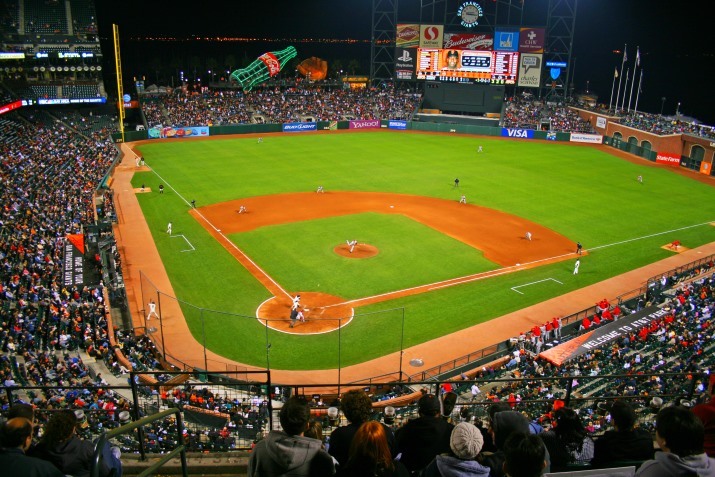 The promenade by the Bay passes AT&T Park, home of the world-champion San Francisco Giants. Inside the high red-brick outer stadium wall, there’s a breezeway where tourists can peer through wire gates and get a free look at the park. The first time I checked the view, I nearly fell over. It was magnificent – it was every lyrical description I’d ever read of what a professional ballpark should be. The outfield was as green as Switzerland – the honest-to-goodness, real, Sound-of-Music emerald stuff. On the mound, a fireballing Phillies pitcher was warming up, throwing cannon shots that we could hear as a muffled pop in the catcher’s glove. Behind home plate, thousands of spectators loomed in perilous rows, in stands so vertical it took my breath way – they seemed to be leaning over the field, in danger of falling. What a glorious park. It lifted my spirits – I felt privileged to witness this very American sports monument, which carried the beautiful energy of a grand tradition. Recently, I’ve been thinking about how our thoughts give us energy when we train. Energy is the solid, workmanlike foundation without which there can never be any joy. Energy makes all kinds of wonderful things possible. Tim Kawakami: I’ve heard Sabean (Brian Sabean, Giants executive VP of baseball operations) talk about this several times–do you feel like the fact that there are sell-out crowds every night at AT&T and there’s such energy every night has helped push this team to the championships? Baer: We really do. This may sound cliché, but I mentioned this last week, it almost felt like the energy from our park, they took it with them to Pittsburgh and then to Washington and St. Louis and then Kansas City last year. They really took the energy they got. We think it’s a hugely enabling factor for us on a number of different levels. No. 1, the fans show up, a lot of nights showing up when you’re coming off the road, plane landed middle of night, get to the ballpark, you know 41,000 are there offering their energy. That’s just completely different than if you had 12,000 there, which means you have 30,000 empty seats. 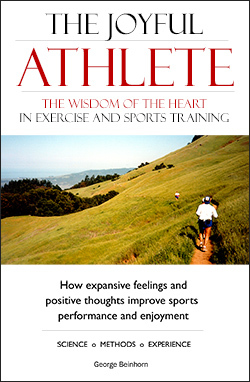 Plenty of sports lore tells us that our attitudes influence our energy. Part of the lore is from science. We know, for example, that positive feelings harmonize the rhythms of the heart so that it can work more efficiently, allowing us to run and play hard with less strain. We’ve all had the experience – too rare – of running superbly, our body cruising for mile after mile with unprecedented ease, while our hearts soared and our mind was bathed in a liberating poise and silence. That’s the scientific side – the lab guys in their white coats, telling us how our hearts prefer to exercise in the presence of expansive thoughts and feelings. 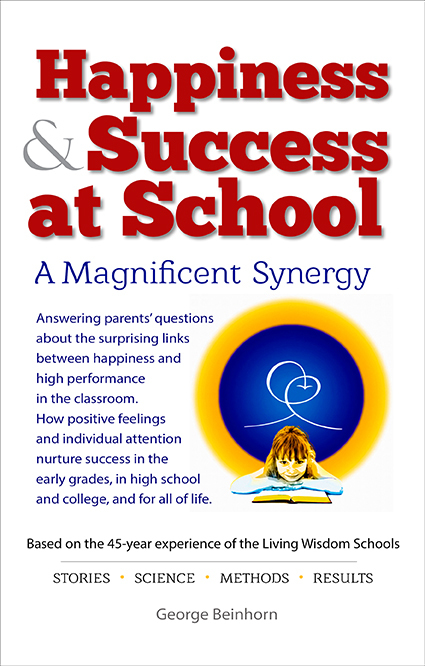 Then there’s the evidence of real-world practice – the results gleaned from the road, trail, and playing field. It seems logical, doesn’t it, that if external factors can make us feel positive and big-hearted, they’ll help us go faster. Factors like playing baseball in a magnificent park before 41,000 adoring fans. We can imagine how it would reduce the stress hormones in our body, and promote positive changes in our chemistry and nervous system. I think these are important considerations. I think they’ll become part of an athlete’s training toolkit. At one time, coaches were a hundred percent focused on science – recall the European coaches of the 1940s and 1950s: Franz Stampfl, Mihaly Igloi, Waldemar Gerschler. Their methods were based on scientific evidence that interval training increases the heart’s stroke volume. The flaw in the formula was that it was too one-sided. It looked narrowly at just one part of performance – VO2Max – and not the whole. It didn’t consider the value of increasing the body’s mitochondria by running many miles at a high aerobic pace. That was the contribution of Arthur Lydiard, whose distance-trained athletes would blow their interval-trained compatriots away. In the 1952 Olympics, interval-trained Czech Emil Zatopek won 10,000m gold in 29:17 Today, that time wouldn’t win many NCAA Division I college races. Perhaps the next step in sports training will encompass even more of an athlete’s makeup. Nowadays, distance runners train for aerobic power and flat-out speed. Tomorrow, maybe they’ll embrace the energizing effects of positive thoughts and feelings. In a brilliant stroke of coaching insight, Tony made a single, subtle change in the way his sprinters ran their 40-meter and 10-meter trials. In electronically timed test runs, using this simple method, 65% and 68% of the sprinters were able to run PRs. The subtle change? Tony had the subject’s teammates line the track and shout their heads off. Receiving external encouragement did something that elevated two thirds of the runners to record their best time. Tony later incorporated the format in a “Gauntlet Mile” at the school’s annual hosted indoor meet, where spectators and runners line the track and yell their support. Despite the tiny 180-yard track, the event produces excellent times. Okay, but have other coaches been able to duplicate the experiment? Years ago, I stumbled out of Stanford stadium after a terrible speed session where I ignored my body’s message that it was exhausted. Shuffling out of the stadium, I noticed that a track meet was underway at Angell Field. I ambled over and was delighted to find that the 10,000 was about to begin. Among the entrants was Brad Hauser, a 2000 U.S. Olympian. Brad won easily in 28:52 – his talent was clearly a cut above the field. I don’t know if it made him faster. Probably not – Hauser was metronomically clicking off 68-second laps, running well within his abilities. But it struck me that it would surely lift a runner’s spirits to have his teammates remain steadfastly planted throughout a 25-lap race and yell their support every time he passed. Yesterday, I emailed Tony the link to a report of a recent track meet at Stanford – it was the annual “Big Meet” between Stanford and archrival California. 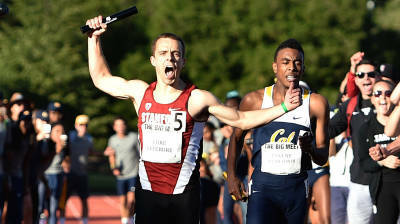 The article enthused about how the Stanford men narrowly defeated Cal in the final event of the day, the 4×400 relay. Stanford had won the event the previous four years, but this year they faced a real challenge. Stanford’s anchor runner, Olympian Steven Solomon, had graduated and would be replaced by Luke Lefebure. Earlier in the day, Lefebure had been beaten in the 800 by the runner he would face in the relay, Cal’s Eugene Hamilton III. As dramatic as the individual events can be, the Big Meet is at its best in the 4×400 relay. Athletes from both teams gather along the track and form a tunnel of noise and chaos that drives the runners to even greater efforts. As Lefebure took the baton for the final lap, he trailed Hamilton. On the backstretch, he held position. From trackside he heard Olympian Solomon yelling encouragement. On the final straight, Lefebure edged past Hamilton. With 20 meters left, there was no denying Lefebure. And as he crossed the finish line, the normally stoic Lefebure raised his arms in triumph and screamed all the while. It was one of those moments that make a Big Meet, and a lifetime memory. What gave Lefebure the energy to dig deep and win? Was it “home field advantage?” Was it his teammates lining the track and screaming? “With 100 to go, just seeing all my teammates there and knowing I had a chance to win … I was just thinking to myself, I can’t lose this,” Lefebure said. The finish-line photo shows the other athletes yelling for Lefebure. As Tony Holler pointed out to me, they’re feeling the joy. It might take the lab guys a while to “prove” that the right kinds of thoughts and feelings give us energy. But like the revolution that Arthur Lydiard started sixty years ago, we really don’t need to wait for science to catch up. The results are in. It’s clear that whatever raises an athlete’s spirits will improve his times.